An adaptation of Ken Follett's enormous medieval novel. Hey, so it turns out that Ken Follett's The Pillars of the Earth is getting a game adaptation, and Daedalic is making it. This news has been floating around since last year, but I'm very glad it came to me with the release of a new trailer a couple of days ago, because—as I've come to expect from Daedalic's games—the art and animation of this point 'n' click adventure/"interactive novel" is top-notch. Here, get a load of it in action in the new teaser video, which comes in "family friendly" ('Teaser 1') and "intense" ('Teaser 2') variants. I recently picked up The Pillars of the Earth from a charity shop, so maybe this will inspire me to get stuck in before the game comes out in 2017. It's scheduled to release at the same time as the third novel in the Kingsbridge series (Pillars is the first one), which doesn't appear to have a release date yet that I can find. 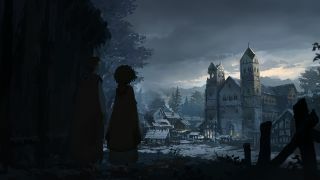 If you're not familiar with The Pillars of the Earth, the YouTube description explains that the game's story will revolve "around the fictional town of Kingsbridge and its rise, switching between the narrative perspective of a young noble called Aliena, Jack the ambitious architect and Philip, a monk".